4 BR - 4 Bath Includes a Sauna! Family vacation traditions begin in Stone Lake View, featuring all the modern amenities you need with the rustic charm you love. On cool evenings, curl up with a crackling fire in the wood-burning fireplace, cozy log furniture, and sauna. Enjoy slow mornings over coffee in the kitchen’s built-in breakfast nook, overlooking the sunrise on gin-clear Stone Lake. The cabin offers plenty of space to entertain friends and family inside and out; around the living room’s dry bar, gathered near the campfire, and on the patio. Stone Lake View is nestled under the towering pines on the southern shore of Stone Lake, part of the Manitowish Chain of 10 Lakes. For fun on the water, kayak across the bay, jump off the large dock and covered boat shelter, or cruise the 10 lake chains with restaurants, bars, and beaches. In the winter months, arrive to Stone Lake View to stay and play; ice fishing just steps from the cabin’s door, ride your sled to the nearby snowmobile trails, and the area’s well known cross-country ski and snowshoe trails. Perfectly situated for experiencing all that Manitowish Waters has to offer including the nearby brewery and a variety of local pubs and restaurants to enjoy! Stone Lake View is 4 bedrooms, 4 bathrooms, with the sleeping capacity of 12. Amenities include campfire pit, private dock + covered boat shelter, sauna, newly remodeled interior, new mattresses, new appliances, central air conditioning, wood burning fireplace, dining seating for 6 people, microwave, coffee maker, dishwasher, refrigerator, mini fridge, laundry: washer/dryer, charcoal grill, WiFi, Direct TV, linens included, towels included. Note: due to a state ordinance, Stone Lake View is available for a minimum of 7 days. Please note: The 2018 Home and Boat Peak Week package will not be continuing in 2019. Don't forget to book a 2nd Pontoon rental with us! Click here to rent! The entire property was well equipped with all the most updated facilities, appliances, and design features. From its location to all its features, our stay was way beyond our wildest expectations. Well look forward to returning to Stone Lake View again in the future! The space was absolutely beautiful, the pictures are great but nothing can replace the feeling when we first walked in.The property was absolutely beautiful and the neighbors were very friendly and nice, made us feel more at home. Everything inside the house was spotless, extremely clean and well taken care of. Cozy, relaxing, great location with gorgeous views! 5 Star! We spent a long weekend at stone lake for our anniversary and had absolutely no complaints! Julie from northwoods home rentals was great to work with and went above and beyond to make our stay exceptional. 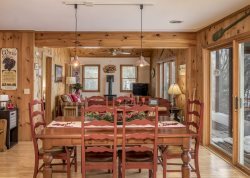 The cabin is pristine and cozy with plenty of space and the most magnificent sunsets and views from the kitchen. They provided everything we needed and more for a perfect weekend away! Kitchen was stocked (even had two sinks and an extra mini fridge), plenty of cozy blankets, and firewood (although we brought our own wood), and more! The location was also perfect as we were able to hop on the Bike trail, go for long walks, grab a bite to eat or a drink in the adorable town of Manitowish Waters. It was also less than 20 minutes from downtown Minocqua. Couldnt have asked for a better stay! We will be booking again next year! Everyone was very helpful and made our vacation one that we will always cherish. Information that was provided to us made the experience well worth it. The men who took care of the grounds were very friendly and knowledgeable about the home and the surrounding area. We were well informed about the property and the use of the pontoon by telephone and emails from company personnel. Excellent!! Great location and the home was well maintained and offered ample room for our family to enjoy. The home was well equipped with everything we needed to make our stay enjoyable. Excellent home and great location. Well equipped home make it easy to relax and enjoy the up north experience. Exceptional. Julie and Staff were first rate through the entire process. Quick replies with email and definitely willing to go the extra mile to ensure our stay was perfect. Fabulous property. Old world charm with modern conveniences Like WiFi, satellite TV and A/C. And did I mention the views!?!? The rental agency was very helpful. I spoke with the owners and they are really nice people. The beds were extremely comfortable. In fact, one of the couples made it a point to write down the make & model of the mattress so they can buy one for their use a home....Tell us about your favorite feature of the property - Nice quiet setting. Great views of the lake. Plenty of parking for vehicles with 2-place and 4-place snowmobile trailers. Nice up to date interior. It was really nice having the kitchen table overlooking the lake. Cozy and comfortable.